I have almost completely switched over to Safari of Firefox, and have found replacements for almost all my Firefox plugins; but the lack of seamless keyword search in the location bar still bugs the hell out of me, enough to make me switch back to Firefox on occasion just for that. However recently I installed Verizon FIOS and noticed that Verizon’s DNS services intercept failing DNS queries through the browser and replace it with Yahoo search results. 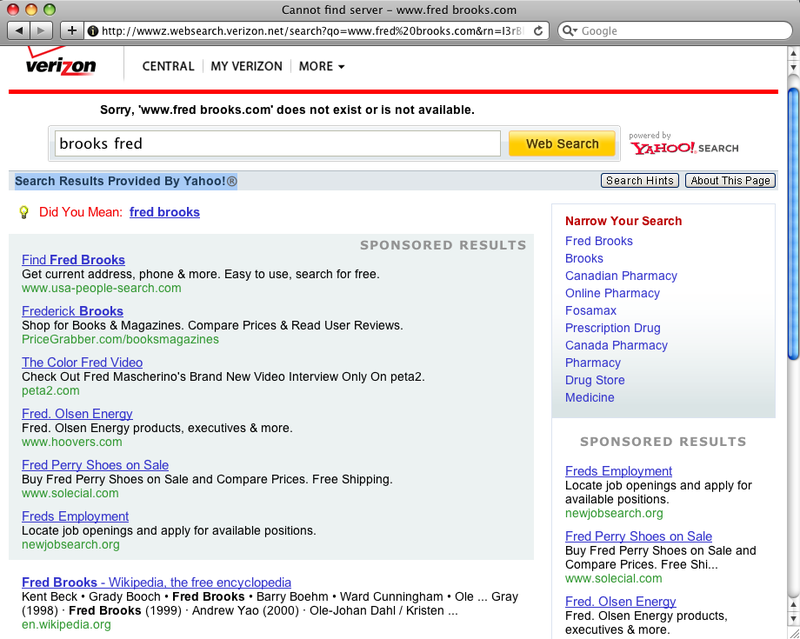 This means I can now type “fred brooks” into the location bar, and get a link to the page I need. For reasons that aren’t exactly clear, most but not all e-mail sent to elharo@macfaq.com has not been arriving for the last 24 hours or so. I’m shifting a few things around to try to fix the problem. In the meantime, please try one of my other addresses if you need to reach me. Hmm, maybe I spoke too soon. In what I can only surmise is simply Murphy’s Law at work, for some reason Thunderbird today started to move all my metalab.unc.edu e-mail into my Junk folder so that wasn’t getting through either. I’ve now recovered that, but bleah. It never rains but it pours. Hmm, you know. Yes! That’s it! Thunderbird’s spam filters went into overdrive sometime around 8:00 PM yesterday evening and began classifying all e-mail as junk, no exceptions. (Apparently there is one exception: accoounts in my address book are not listed as Junk. That’s why the test messages I sent from me to me still got through.) Now how to fix it? I finally have the Internet up and running in the new apartment. Cox took a few days longer to get this all setup than they should have. Then it took a few hours to figure out how to trick the cable modem into thinking there’s only one computer talking to it. Kudos to Cisco/Linksys for providing detailed instructions explaining exactly how to do this. This connection is much faster than my old SpeakEasy DSL line and about half the price, but the company you have to deal with is much more obnoxious. I considered staying with SpeakEasy in the new place, but they were limited to 1 Mb down, 128kbps up in this location. :-( FIOS was also not available here. Mokka mit Schlag, The Cafes, www.elharo.com, and beand.com are all restored to service after Wednesday night’s network outage. Please holler if you notice any problems. There may yet be a few glitches. I still don’t know exactly what went wrong. I do know that at the time the network went down I had Warcraft, VOIP, BitTorrent and this server running simultaneously. However that’s not unusual. Based on what it took to eventually fix this, the mostly likely scenario is that Speakeasy/Covad failed. At one point I thought my internal router from D-Link had failed. I did buy a new Linksys router to replace it (A WRT54G. I wasn’t able to find a 54GL on short notice. :-( ). However installing the new router did not fix the problem. Speakeasy has shipped me a new DSL modem, but that has not yet arrived. What finally fixed the problem was Speakeasy asking Covad to do a “manual rebuild of the circuit”. Previously Speakeasy had done a “rebuild and reprovision” from their end, but apparently Covad can do something Speakeasy can’t. Next time I’ll know to ask for a manual rebuild if the initial rebuild fails. Not that I have any clue what any of this means. However it does seem undiagnosable apart from just doing it. The first two SpeakEasy reps I went through did not suggest the manual rebuild. Speakeasy had yet another service outage while I was in Boston a couple of weeks ago and a smaller one this past weekend. Both times the problem was completely on their end, and the first and more serious one they didn’t notice until I told them about it a few hours into the outage. Now that they’ve been acquired by BestBuy I expect service will only get worse, so I’m looking for alternatives. The two major providers in my area are Cablevision and Verizon, and they’re both about as trustworthy as a Republican who promises to cut government spending. However, it occurs to me that maybe I can counterbalance them against each other. Is there any device/software which will enable me to bind two separate and independent Internet connections? I’d like my network to use both Cablevision and Verizon or Speakeasy at the same time. If one goes down, the other would shoulder the full load. Otherwise traffic should be split between the two so I get the most bandwidth and lowest latency possible. To make matters still more complex I want at least some static IPs to run public servers like this one, and I want full control of my local network: no silly rules about what devices I can or cannot connect or whom I can talk to at what speeds. Of course, I’m not wedded to Cablevision and Verizon. I’d really rather not consider them at all; but I do need to at least have an alternative to Speakeasy ready for the next time it goes down. However if there are other options in Brooklyn, I’d be happy to consider them. RCN does not service this area though; and given my apartment’s non-existent view of any sky, neither is satellite. Possibly other wireless providers might work, but I need heavy bandwidth for web servers and downloading Linux CDs and such, so download-capped plans aren’t very plausible. Any suggestions?